Al-Ibādhiyyah (Arabic الاباضية) is a denomination of Islam. It is the dominant form of Islam in only one Muslim country, Oman. There are also Ibadis in Algeria as well as Libya. It is probably one of the earliest schools, founded less than 50 years after the death of the prophet Muhammad. The branch developed out of the seventh-century Islamic sect known as the Khawarij or Kharijites. Some Ibadis however do not consider themselves to be Kharijite. Some Ibadi doctrines permit an individual interpretation of hadiths, by stressing the use of common sense. The name is from ˤAbdullāh ibn-Ibāḍ at-Tamīmī. Some followers of this branch, however, claim its true founder was Jabir ibn Zaid al-'Azdi from Nizwa, Oman. barā'ah: do not deal with unbelievers and sinners; and show a certain hostility towards them, and those destined for Hell. wuqūf: reservation towards those whose status is unclear. Unlike the Kharijites, Ibāḍī have abandoned the practice of assassination of mainstream Muslims. Ibāḍīs agree with Sunnis in approving of Abū Bakr and Umar ibn al-Khattab, whom they regard as the two rightly-guided Caliphs. They think Uthman ibn Affan has introduced bidˤa "innovations" into Islām. They approve of the revolt which overthrew him. They also approve of the first part of ˤAlī's caliphate, and, like Shi'as, disapprove of ˤĀ'isha's rebellion against him and also disapprove of Muˤāwiyya's revolt. However, they regard ˤAlī's acceptance of arbitration at the Battle of Siffin against Muˤāwiyya's rebels as un-Islamic and as rendering him unfit for the Imamate, and they condemn ˤAlī for killing the early Kharijites of an-Nahr in the Battle of Nahrawan. Muslims will not see Allah on the Day of Judgement. This is derived from the Qur'an where the Prophet Ibrahim is told upon asking to see Allah, "You shall not see me." This is contrary to the mainstream Sunni belief that indeed Muslims will see Allah with their eyes on the day of Judgment -- (without our specifying how and in a manner Allah knows best). This matches the beliefs of Shia Muslims. Imam Ali (AS) "Eyes can not see Him, but he can be seen by the realities of FAITH" Nahj al-Balaghah. Whosoever enters the Hellfire, will live therein forever. This is contrary to the Sunni belief that those Muslims who enter the Hellfire will live therein for a fixed amount of time, to purify them of their shortcomings, after which they will enter Paradise. Sunnis also believe that unbelievers will remain in Hell forever. The Qur'an is created. The Sunni community holds vigorously that the Qur'an is uncreated, as exemplified by the suffering of Imam Ahmad ibn Hanbal. Much of the Shi'a community also holds that the Qur'an is created, one of many theological beliefs that they share with the Mu'tazilah. Ibadis do not see the Sunni hadiths Kutub al-Sittah (nor the Shia hadiths) as canonical, but rely more on individual interpretations. In their belief, the fifth legitimate Caliph was Abdullah ibn Wahb al-Rasibi. All Caliphs from Muˤāwiyya onwards are regarded as tyrants except Umar ibn Abdul Aziz, on whom opinions differ. However, various later Ibāḍī leaders are recognized as true imāms, including Abdullah ibn Yahya al-Kindi of South Arabia and the imāms of the Rustamid dynasty in North Africa. 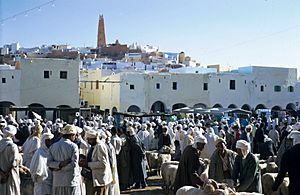 Ibāḍī Muslims are also found in Jabal Nafusa in Libya, Mzab in Algeria, East Africa (particularly Zanzibar) and Djerba Island in Tunisia. The early medieval Rustamid dynasty in Algeria was Ibāḍī, and refugees from its capital Tahert founded the North African Ibāḍī communities which exist today. Ibadi Facts for Kids. Kiddle Encyclopedia.